The president gave Kabul residents Monday off and declared Tuesday a national day of prayer. Afghanistan declared Sunday a day of mourning after a Taliban car bombing in Kabul left at least 103 people dead and more than 200 others injured. The explosion happened Saturday near diplomatic and government buildings. It's the second deadly attack carried out by the Taliban in a high-security area of the capital in roughly a week. On Jan. 20, gunmen stormed the Intercontinental Hotel and killed 22 people, including at least four Americans. 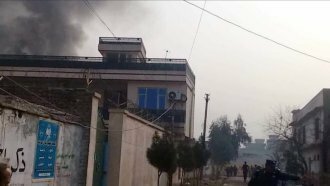 Analysts say the attack shows an escalation in tactics; in a statement, a Taliban spokesman said it had a "clear message" for President Donald Trump. Last year, Trump's Afghanistan strategy called for upping American forces there to roughly 14,000. He also called for more airstrikes. Afghan President Ashraf Ghani declared Monday a day off for those in Kabul and said Tuesday would be a national day of prayer.